BACKBEATS-UNEXPLOITED AND UNDERRATED-MORE CONTEMPORARY MODERN SOUL GEMS. Ever since the heady days of the Northern Soul scene, British DJs and record buyers have been on a mission to unearth rare records. These are either underrated tracks that previously, have been released to apathy, and since then, have remained unloved and unheard. Often, these are some seminal soulful gems just awaiting discovery. Many of these tracks are extremely rare and can change hands for hundreds, if not thousands of pounds. To find these hidden gems, requires patience, persistence and sometimes, luck. Crate diggers head to backstreet record shops, dusty basements, warehouses, car-boot sales and junk shops, all in the hope of finding that elusive rare record. Often, rare records can be found in the unlikeliest of places. Everyone has their own story of finding that elusive record in the unlikeliest of places, often for a bargain price. Next stop is to head home and discover your hidden gem’s soulful delights. Having discovered that elusive hidden gem, you take it home, and with some trepidation play it. After a few bars, you realise not only are you listening something very special, but hugely underrated. When you let friends hear it, they too fall in love with this hugely underrated, soulful gem.You begin to find out more about the artist. Sadly, you discover that they neither enjoyed the commercial success nor critical acclaim their talent deserved. Often, that was their only recording. Now their dream is over, they’re working in a factory or pumping gas. All too often, you hear this story of hugely talented and underrated artists who should’ve enjoyed commercial success and critical acclaim. Sad as this is, there’s nothing most people can do to rectify this, unless of course, your name is Ian Levine. In 1987, Ian Levine began recording artists who’d recorded for various American labels, including Motown. Recording of tracks took place in Los Angeles, London and Detroit between 1989 and 2009. Eventually, he’d recorded sixty former Motown artists. Ian produced and cowrote many of these tracks, including sixteen of the eighteen tracks on Unexploited and Underrated, which was one of the Backbeats’ compilations released on 25th March 2013. 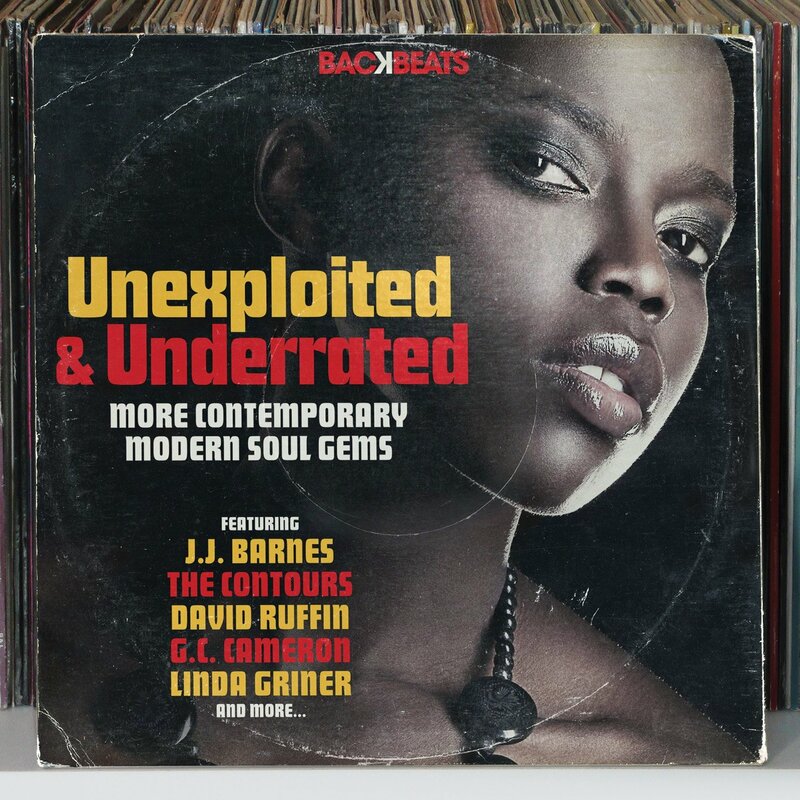 Among the artists that feature on Unexploited and Underrated are The Elgins, Billy Preston, The Contours, The Originals, Gina Foster and Betty Lavette. With so many well known names on Unexploited and Underrated, choosing the highlights isn’t going to be easy, but hear goes. The track that opens Unexploited and Underrated, compiled by Simon White, is an example of how Ian Levine rejuvenated a group’s career. Back in the mid-sixties, The Elgins released like Darling Baby, Heaven Must Have Sent You and I Understand My Man on V.I.P. Records, plus their debut album Darling Baby in 1966. Then in 1990 The Elgins signed to Ian’s Motorcity Records, where they released 1990s Take The Train and 1991s Sensational. Then in 2004, Don’t Wait Around was released. It featured Yvonne Vernee on lead vocal, who took over lead vocal duties from the late Saundra Edwards. Don’t Wait Around became a Modern Soul classic, and the 2004 7” Remix brings new life and meaning to a track Ian Levine cowrote. Billy Preston was one of the few musicians to play with both The Beatles and The Rolling Stones. Indeed, Billy worked with most of music’s big names. He also enjoyed a long and successful solo career, releasing albums for Vee Jay, Apple, Capitol, Buddah and A&M. In 1990, Billy hooked up with Ian Levine and recorded You Are The Rhythm In My Life. The result is a glorious mid-tempo track, where Billy’s heartfelt, emotive vocal shows that he’d not lost any of his talent. Ian’s remix with stabs of horns and swathes of lush string compliments Billy’s vocal Magnus Opus. Instead of the original, the version on Unexploited and Underrated is the 2006 Remix, which somehow surpasses the original. Quite simply, this is one of Unexploited and Underrated highlights. J.J. Barnes’ career began in 1964, when he released Poor Unfortunate Me (I Ain’t Got Nobody) on Ring Records. He then released a series of singles on Ric Tic, including Please let Me In, Day Tripper and Say It. After that, J.J. released singles on Volt, Motown and Perception. Then in 1991, J.J. recorded the Edwin Starr and Ian Levine penned I’ve Seen The Light. It was produced by Ian Levine and released on Motorcity Records. This dance-floor friendly slice of Modern Soul introduced a new generation of music lovers into J.J. Barnes. One of the most welcome additions on Unexploited and Underrated is David Ruffin’s Hurt The One You Love. The reason for this, is it’s the last track David recorded. Written by Ronnie McNeir, Ian Levine, Ronaldo Benson and Mike Crump, it’s a fitting, poignant and classy reminder of one of the great names in soul music. David’s rasping and impassioned vocal becomes a heartfelt, pleading vamp. He’s accompanied by one of the best arrangements on the compilation. With its blazing horns, soaring harmonies and sultry saxophone solo, Ian and Ronnie’s production is a fitting accompaniment to David’s vocal and a fitting memory of the ex-Temptation. Before embarking on a solo career, James Epps was lead singer of the Fantastic Four. James is known as one of the finest voices in soul music. The Fantastic Four’s career started at Ric Tic, during the mid-sixties and they enjoyed their biggest hit with 1965s The Whole World Is A Stage. Later, they released five albums for Westbound, after releasing The Best Of The Fantastic Four on Soul in 1969. Then in 1992, they released Back In Circulation on Motorcity Records. The title-track Back In Circulation was penned by James and Ian Levine. On Unexploited and Underrated, the Metropolitan Soul Mix of Back In Circulation by Sweet James Epps allows newcomers to the Fantastic Four to experience one of the greatest and most underrated vocalists in soul music. By the time The Originals joined forces with Ian Levine, they’d enjoyed a long and successful career. Their recording career had started in the mid-sixties and had released eleven albums, including 1975s California Sunset on Motown. Their final album was 1981s Yesterday and Today. Nine years later, The Originals recorded Love Still Lives In My Heart. It featured on Motorcity Records’ 1990 compilation Motorcity Love Songs and is one of the most beautiful songs on Unexploited and Underrated and features the same lineup that recorded the classic track, Baby I’m For Real. Blthough Bettye Lavette’s career began back in the sixties, she only released her debut album Tell Me A Lie in 1982 on Motown. It would be another nine years before she released her sophomore album Not Gonna Happen Twice for Ian Levine’s Motorcity Records. One of the tracks on Not Gonna Happen Twice is Too Great A Price To Pay written by Ian Levine and Jake Jackas. From the opening bars, you realize something special is unfolding. When Bettye scats, her world weary voice sounds as if it has lived a thousand lives. Cooing harmonies and rasping horns provide a perfect accompaniment as Bettye lays bare her soul, hurt and heartache for all to hear. My final choice from Unexploited and Underrated, is Barbara Randolph’s Soul Searching. It’s a case of from one great female vocalist to another. Amazingly, while Barbara’s career began in the mid-sixties, she’d never released an album until she met Ian Levine. Her discography featured a handful of singles, including I Got A Feeling and Can I Get A Witness. Realizing the raw talent and potential of Barbara Randolph, Ian Levine got Barbara into a studio. The result was Breaking Into My Heart, which featured the deliciously soulful, and emotive musical journey that is Soul Searching. What a way to close Unexploited and Underrated, with a truly underrated, hidden soulful gem, one that you must hear. When Ian Levine decided to head off on his voyage to discovery, to find some of soul music’s forgotten and underrated artists he’d no idea he’d where his journey would take him. It was a journey that lasted five years and during this period, he rediscovered 108 artists and released 800 tracks and brought their music to a new generation of music lovers. During this period, he was on the front page of every Detroit newspaper. His love of Motown, turned into an incredible story, one that’s reminiscent of a Hollywood script. One minute previously forgotten artists are pumping gas or working in diners, the next, Ian Levine takes them into a recording studio to record new material. Much of that music was music he cowrote and produced. Indeed, Ian Levine is a successful songwriter and producer, whose enjoyed success over three decades. What started off as a passion, when he first heard soul music, became his career. Underrated and Unexploited, which is one the latest batch of Harmless Records’ long-running and commercially successful Backbeats’ compilation that was released on 25th March 2013, and is an introduction to Ian Levine, songwriter and producer. Not only is Ian Levine a successful songwriter and producer, but he’s a passionate and legendary record collector, who loves discovering Underrated and Unexploited music, just like the eighteen tracks that feature on the Backbeats’ compilation Underrated and Unexploited. Standout Tracks: The Elgins Don’t Wait Around, David Ruffin Hurt The One You Love, Bettye Lavette Too Great A Price To Pay and Barbara Randolph Soul Searching. ← BACKBEATS-DETROIT GOLD-70S SOUL GROOVES FROM MOTOR CITY. Unfortunately, The Backbeats’ series is a CD only series. I don’t know whether Harmless have considered putting out vinyl editions? However, there’s eighty minutes of music on the disc, I suppose that would mean a double album, which would be expensive. Instead, the CD costs £3-£4.For what a double-album would cost, you get 5 or 6 of the CDs. It’s a really good compilation series for anyone who likes their funk and soul. Hope you’re enjoying it.